I tried Aveda Color Conserve Conditioner along with the Aveda Color Conserve Shampoo, and like the latter I had a terrible time with it. I have dyed red hair which is well known for having the color bleed out when you wash it, and some shampoos and conditioners cause more color 'bleed' out than others. Having the name 'color conserve' I thought it would help preserve my color and have it make my hair color last a longer time. This was sadly not the case. If your hair is not a bottle red, like say a platinum blonde, or it is bleached than you might have better luck with this conditioner than I did. It did however work as a good conditioner. It made my hair feel luxuriously soft and luscious. But for the price I could get a conditioner nearly as soft, and one that does not strip my hair of it's color. I would only recommend this protect to people who have dyed hair that is not known for bleeding otherwise just save your money. I like several Aveda products, so I assumed I would like their conditioner and shampoo for color treated hair. Unfortunately I was disappointed that it left my hair feeling dry, stripped and frizzy. I spent much more money than I usually do on shampoo and conditioner, so I wanted to give it a fair shot, so I used it several times, hoping it would produce better results after a few uses. But the more I used it, the worse my hair felt and looked. I started using it on freshly colored hair to see how it protected the color and the first few days I did not notice a difference in the shade of my hair. But by day three or four, I could already see that my hair color was beginning to fade. It was also stripping all the shine and moisture out of my hair. I had hoped it would add back some much needed moisture, but that was not the case. I went so far as to use a deep treatment hair conditioner after shampooing and conditioning, but that too was unable to add back the moisture this shampoo and conditioner stripped out of my hair. It took weeks of using another brand to get back to were I started. I had my hair colored at an Aveda salon recently and I was very impressed with the fact that everything was plant-derived, even my hair coloring-there was no nasty chemical odor when it was applied. The stylist recommended Aveda Color Conserve Conditioner and I took it home. The price is a little exorbitant, but it does the job-its so refreshing and smoothing and doesn't let my tangly hair tangle up. It prevents breakage very well. I recommend it if you can afford it. Effectiveness It is protecting my hair color nicely and helping me prevent tangles. It moisturizes well. Scent Very pleasant. Color Conserve Conditioner is a convenient way to keep your hair at its shiny vibrant best. Available at Aveda Salons and Shops, it is a fairly inexpensive method to keep colored hair conditioned and healthy. Effectiveness Highly effective especially when used in tandam with the Color Conserve Shampoo. No chemical ordors or side effects Scent Refreshing and vibrant , but subtle - will not clash with your personal fragence choices. Aveda Color Conserve Conditioner smells great! I have been using Aveda Color Conserve Conditioner for many years now, and I can honestly say that when combined with Aveda Color Conserve Shampoo, it really does what it says - conserves color! I usually wait at least twenty-four hours before I shampoo my hair after a color treatment, but when I wash my hair for the first time, I don't have to worry that all the color is going to wash right out and look different when it's dry again. When the color does finally start to fade after weeks and weeks, it fades gently and naturally, so I don't have to deal with noticeable roots. 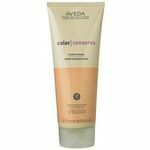 I love Aveda Color Conserve Conditioner because it smells amazing!! It leaves its fragrance in your hair, even when it's rinsed and dried, so you smell good all day. It's also great at getting the tangles out of your hair. I have very fine hair, which tends to get tangled a lot, and if I use a cheap conditioner, I have to spend a long time combing out the tangles when I get out of the shower. With Aveda Color Conserve Conditioner, I rinse my hair, wear it in a towel for a few minutes, then run a brush right through it, and I hardly ever have to deal with tangles! I love it! I'll start off by saying that I love Aveda products. I don't usually buy into the more expensive brands, but with Aveda you get what you pay for. The scent of this product is amazing. You'll feel so pampered after having used this conditioner. It works great on your color and keeps it lasting and vibrant. My hair has been so much smoother and healthier since I've started using the Color Conserve Shampoo and Conditioner. My hair always looks and feels silky and I get compliments all the time. It works great, but my favorite part is how great it leaves your hair smelling all day. It reminds me of a trip to the spa without actually have to spend a day at the spa. It's definitely pricier to buy every month but it's completely 100% worth it! Aveda Color Conserve Conditioner works wonders! Aveda Color Conserve Conditioner really works wonders. I love this conditioner because it actually works. If you ahe color-treated hair, then this product is for you. Aveda Color Conserve Conditioner really allows me to go a lot longer before I get my next hair coloring. I can really tell when I haven't been using this conditioner. I have to have my hair colored more frequently then. So I try to be a regular consumer of this product now. I really like what it does to my hair, too. It keeps out all tangles, so you don't have a difficult time after shampooing. It also keeps your hair manageable and alive and fluffy, so soft when you touch it, you think you're touching a cloud. It's so fabulous. I don't even have any static when I use this conditioner. It simply is a great conditioner and one that I recommend quite highly. If I could have rated this item 6 stars out of 5, I would have done that. No other conditioner for color treated hair compares. I don't what it is about this conditioner that is so good. But, to me, it IS good. It is great. Yes, it conserves your color. It makes your hair coloring last longer between hair colorings. That is what I look for now in a shampoo adn conditioner. But there's something else about this conditioner. Like I said, I have not yet put my finger on it. But I will someday. It does everything a conditioner should do and more. It conditions the hair. It protects the hair. It makes the hair healthy and maintains the healthiness of the hair. I love using it because it makes my scalp feel good as well. I tend to leave it on more than I should I guess. But it feels so great to my scalp. It lathers up quickly and very well. It rinses out easily and quickly, too. It keeps your hair detangled so you don't scream your lungs out when you get out fo the shower and try to comb your wet hair. Believe me, I have used many conditioners in my day and many don't even do that. I am always looking for new hair products to try because I put my hair through a lot with the blow dryer and highlights and I want it to stay looking healthy. My favorite new hair product is this **Aveda Color Conserve Conditioner** which is not only a great conditioner for my hair, but really works at preserving my hair color. I add highlights to my hair a couple times a year just to keep a fresh look and make my hair look alive, but I hate when the color starts to fade. I have always loved Aveda, so when I tried this product I was pleasantly surprised at how great it worked and is now my go to conditioner. I used this conditioner after getting highlights and it really seemed to seal in my color and keep it looking vibrant longer. The conditioner seems to wake up my color when I use it and make it shine. I love that the lather is rich and creamy, but it doesn't make my hair feel heavy or greasy and rinses out easily. It adds a lot of softness and healthiness to my hair and smells great. 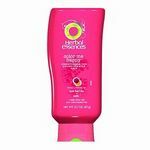 This is a great conditioner to soften your hair and make your color shine. Every girl is self conscience about their hair. Women are judged based on it. 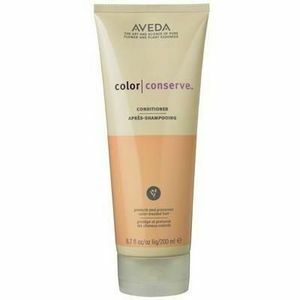 Aveda Color Conserve Conditioner is one of the vesy best products on the market today. It will make your hair so soft, you will not even believe it! This works for women who dye their hair weather it is once or once a month! This conditioner will mosturize your hair along with conserve the dye so your color does not fade away! Aveda is all natural and organic, so you know that no unwanted chemicals or acids will kill your hair. This is top of the line stuff! If you want to fix damaged color hair or perserve the colors life in your hair, this is the number one product. It is a must need conditioner. Every girl could use this. It makes your hair as soft as silk, and brings out the color in your hair, so you look amazing. Your hair will not ever feel dry and damaged and faded. It will look superb. It is like silk in a bottle. your hair will feel forever young. It is a must get !